Navigation: Home » Economics » How Many Developers are There in America, and Where Do They Live? How Many Developers are There in America, and Where Do They Live? In 2015, we estimate there were between 3,357,626 and 4,185,114 people working in a role which required software development. Furthermore, we estimate that between 2.00% and 2.50% of all workers in America had a development related role in 2015. Which States Have the Highest Concentration of Developers? Washington D.C. had the highest percentage of developers – a full 6.46% of workers living there met our extended definition. Virginia and Maryland came in second and third, at 4.43% and 4.41%, respectively. At an absolute level, California, Texas and New York of course led the way – with 628,414, 324,717, and 218,041 workers respectively. (Virginia was the surprise at #4 with 204,699). As a check on these numbers we direct you to Evans Data Corporation, who host the most extensive biannual report on developers worldwide. Also of interest is Janel Garvin’s blog (Evans’s CEO), where she writes on some key insights from their survey. Evans pegs the number of worldwide developers – including hobbyists who can also code – around 21,000,000. In North America they put the number of developers around 4.4 million. This fits excellently with our estimates, especially considering we’re not factoring in retired developers or hobbyists. Steven Ruggles, Katie Genadek, Ronald Goeken, Josiah Grover, and Matthew Sobek. Integrated Public Use Microdata Series: Version 6.0 [dataset]. Minneapolis: University of Minnesota, 2015. http://doi.org/10.18128/D010.V6.0. There are many job descriptions in the BLS’s 2010 update of the occupation labels. No matter how we slice it there’s bound to be disagreement as to who constitutes a ‘developer’ or who requires familiarity with code at work . We’ll take a shot anyway. If you disagree with our picks, feel free to rerun the numbers and we’ll link to your results. How did We Define a ‘Strict‘ Developer? Our goal for this category was for pure software developers. We started with the core developer, programmer, and DBA categories from the BLS. 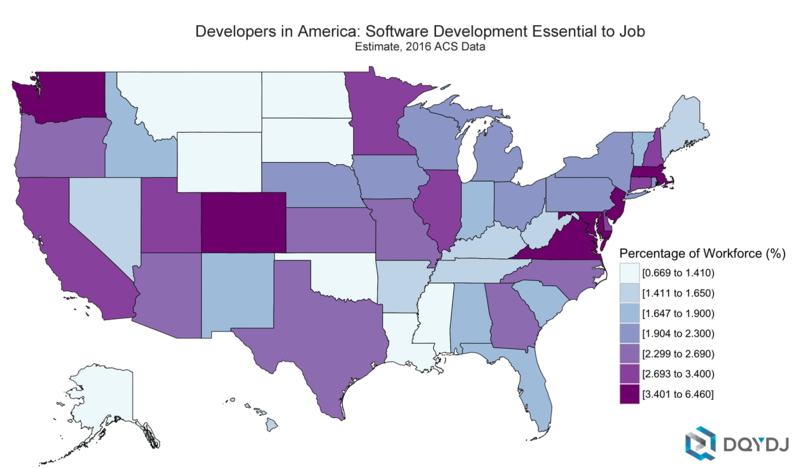 It misses some obvious software professions such as embedded (or “IoT”) and driver developers, but is a good core estimate and the bulk of developers in America (roughly 80% of our final set). How Did We Extend Developers for Our Second Set? Our second grouping includes all of the professionals in the strict categories above, plus other professionals who almost certainly are either writing or reading code on a regular basis. This includes the aforementioned workers in the Electrical and Hardware Engineering categories, as well as Technical Writers, CAD Programmers and Operators and the like. I’ve also included Sales Engineers, positions which are usually filled with folks who were previously in an engineering role. This bucket consists of roughly 475,000 people. How Did We Define Our Most Expansive Set of Developers? Although this category will be controversial, we tried to estimate the number of other people writing scripts and code outside of software and electrical engineering. Actuaries, statisticians, analysts, mathematicians and economists often use SAS, STATA, Mathematica and (this article’s enabler…) R. Others use Matlab, Octave, Sage, Excel and OpenOffice as well as traditional languages Perl and Python. To make it very clear – all the data in the article is for people who worked or earned a living from (at least partially) development in 2015. We didn’t attempt to estimate developers who no longer work in these categories, or those with development training in school. Additionally, we didn’t try to add hobbyist developers to the mix as in the Evans’ data. Notably though, we do include self-employed developers in all above categories. Also, we assuredly left out many categories of worked who tangentially write code. Certainly some of the other science and engineering disciplines write a fair amount of code (a lot of them in Perl!). If your target is “anyone trainable in a few months”, our estimates are low. If you’re looking for anyone “who could start coding within a couple weeks”, look at Group 2 and Group 3. We hope this article was as interesting to you as the research was to us. It goes to show that there are quite a few people in the United States who are required to be proficient in – or at least familiar with – code. Is the data specific to the software industry? If not then I’m sure many people in the group 2 definition never touch or look at code. My company has lots of people in that group who would have nothing to do with software. I doubt group 3 people at even software companies are ever writing or even looking at code. No, there is no narrowing by industry in the data-set (but it might be interesting to compare, say, incomes of developers in software firms vs. elsewhere). Originally, I was a Category 2 (CECS) and I’ve been writing code all along, for what my anecdote’s worth. Category 1 is probably safest; I’ll keep the same category breakdowns as we go along so you can see how it breaks down by zip/county.